Growing up, making choices, being responsible for yourself and the choices we all make might seem everyday to some, but for 12-year-old Sandy, it is a new and liberating experience. Sandy has grown up under the influence of her widower, rugby-coach father and her athletic older sister Roxie. 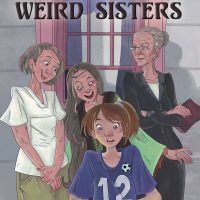 When her father and sister go to England for a rugby tournament, they leave Sandy in the care of her three great aunts, referred to in family lore as the “weird sisters.” The mysterious Weird Sisters have not been seen in years; or so Dad says. Each of the aunts espouses a different faith — Catholicism, Mormonism, and Unitarianism — and yet they respect and support each others’ practice, while Sandy views them as the outside seeker of truth she truly is. Sandy enrolls in a literature course, dance classes, and winds up in a community musical production, abandoning the girls’ soccer team with which she is supposed to be playing. During her three weeks with her aunts, and never having attended any religious services before, she takes part in services and activities at each of her aunts’ churches, finding things that she admires as well as things that confuse her. Her identity of self is to be forged during these three weeks — striking while the metal is hot, so to speak — an identity that she will take the remainder of her life to fashion and finish. Reading level of 10+ to adult.